Recycle Bin is mainly a computer term used to refer to a special folder for storing files temporally which have been deleted by a computer user, but have not yet been permanently removed from the computer. Because it is very easy to throw something into the trash and then at the long run later find out that you really need that thing, Recycle Bin is considered to be one of the things that almost everybody uses in a computer because of it’s important. Thus it functions as a directory of all the files that have been deleted in a computer, it keeps tracks of where or from which folder/location in the computer that file was deleted and also enables the computer user to either undelete the file or delete the file permanently. 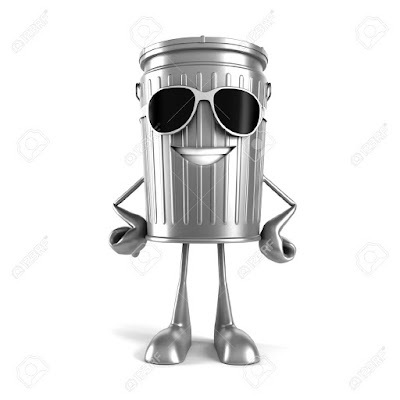 A real life example of the purpose and importance of the Recycle Bin is the trash can we keep outside our homes, and for this reason, many people may decide to refer to it as trash or trash can. Apple Inc. sued to prevent other software companies from offering graphical user interfaces similar to its own. Apple lost most of its claims but courts agreed Apple's Trash icon was original and protected by copyright. Non-Apple software may use other metaphors for file deletion, such as Recycle Bin, Smart Eraser, or Shredder”  This implies that there is no one specific graphical portrayer or computer icon that is that is used to represent Recycle Bin, and that the name may vary depending on the computer OS that your/a computer is using, but the concept and the function remains the same, mainly, serve as a backup for deleted file, especially in the case of mistaken delete of the computer file. 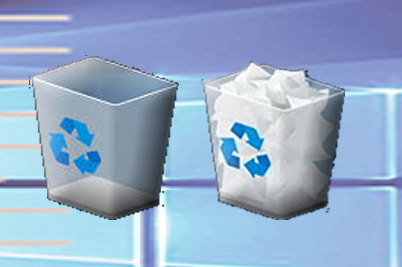 In computers running Windows operating system, the Recycle Bin is set by default to take 10% of the total space of the hard disk of that computer, and though the Recycle Bin icon may appear in the different user account of that computer, it is a known fact that they all share the same 10% storage space from the hard disk, not that each user has it’s own. Though the image above shows the default icon that represent the Recycle Bin folder/directory in Windows10 OS when it is empty and when there is content in it respectively, the icon can be changed manually or automatically by the theme you apply to your computer. Type Icon in the search box of the Control Panel and click on Show or hide common icon on the desktop which is under the Personalization group in the result. In the Desktop Icon Setting dialog box that will appear, select the icon representing the state of the Recycle Bin that you want to change (whether when the Recycle Bin is empty or not) and click the Change Icon button. From the pool of pre-design icon, select the one you will like to change the the Recycle Bin to in the Select an icon from the list below section or click on the Browse... button if you have design one or have download the icon you desire to use. Finally click OK to exist the Change Icon box and click OK again in the Desktop Icon Setting dialog box to save the change(s) you have and also the exist that box. Microsoft first implemented the "trash can" concept in MS-DOS 6, under the name Delete Sentry: When a file was deleted, it was moved to a hidden SENTRY folder at the root of the drive. Microsoft introduced its current trash system, the Recycle Bin, with Windows 95, as an area to store and review files and folders prior to deletion. You cannot create a sub-folder in the Recycle Bin directory of Windows. You can only preview the thumbnails of files in the Recycle Bin but cannot open it for full preview or for editing. Files that are in the Recycle Bin that are 30 days old will be automatically deleted from Recycle Bin, thereby removing the file(s) permanently from your computer hard disk. Thank you very much Samion Eric. I am really grateful for your display of your appreciation in this way.